At TAILORS' KEEP, we believe that an exceptionally fitted suit is more than just an outfit. It’s how a man advertises his capability, letting the world know that he is ready and able to take on any challenge that comes his way. Thus, we specialize in creating custom fit clothing options that not only look good, but that make the men who wear them feel invigorated and sharp. But if you’ve ever wondered why, exactly, you should invest in fitted mens clothing, we get it. It often seems easier to head over to one of the hundreds of outlet clothing stores that sell generic-sized clothing and buy your outfits the way you always have. What you may not know, however, is that custom men’s clothing can be affordable, convenient, and practical. And we’re here to tell you how. Purchasing your clothes from a perfect fit clothing store is essential if you want to ensure that the best quality materials are being used in the construction of your garments. Whether it’s a sophisticated herringbone wool suit jacket, or a dapper windowpane linen vest, a professional tailor can find the ideal material for you. In the long run, premium materials that are made from high-grade fibres not only make for a better-fitting garment, but they also last longer. Natural fibres like cotton, wool, and linen are heftier than synthetic options like acrylic or rayon, making them less susceptible to wear and tear. Additionally, higher-density fabrics hold their shape better, meaning your suit will fit your body perfectly for months (if not years) to come. At TAILORS' KEEP, we pride ourselves on only sourcing the most superior fabrics for our creations. It’s a standard our clients recognize, and one that separates us from other companies who offer bespoke clothing online. When you make the switch to custom men’s clothing, you open up a world of possibility when it comes to expressing your own personal style. Suddenly, there are no limitations. If you can envision it, you can wear it. Choose rare and unique cuff buttons that pair well with handmade ties, line your jacket with a smooth and luxurious silk, or take your trousers to the next level with an unexpected tapered hem. When it comes to bespoke clothing, the sky really is the limit. We recommend checking out these top men’s fashion trends of 2018 for some stellar sources of inspiration. At TAILORS' KEEP, we consider ourselves custom clothing San Francisco connoisseurs. Our team of qualified and highly-trained tailors have a relentless passion for what they do, and they are always thrilled by the opportunity to serve as a resource for our loyal clientele. Wondering which style of suit jacket will work best with your body type? Our tailors know the answer. Not sure how to accessorize your suit without looking too flashy? We can recommend finishing touches that compliment your ensemble in a subtle way. Are you interested in trying a more bold pattern choice, but feel hesitant to trust your own fashion choices? Our team of dedicated professionals are always up-to-date with the latest trends and know how to find a timeless fabric that leaves a lasting impression. When you invest in men’s fitted clothing, you’re investing in fashion veterans who have taken the time to hone their skills. Our tailors produce carefully-crafted custom suits in San Francisco and unique garments that are specifically designed with you in mind. Much like you wouldn’t trust an average joe with a lawnmower to landscape your yard, why trust a global, generic clothing company to create immaculately-fitting clothes for your body? There are some tasks that require the personal touch of an expertly-trained craftsman - the making of your suit is one of them. This point almost goes without saying, but it’s always worth reiterating: one size never fits all. The snug, yet comfortable and flexible fit that comes with a custom-made garment is the ultimate indulgence. It allows you to feel confident, cozy, and crisp every time to step into your tailored outfit. At TAILORS' KEEP, our unparalleled attention to detail ensures you get a suit that stuns your onlookers, every time. We don’t quit until every inch of your ensemble fits the way it should, with clean lines and razor-edge precision. Because off-the-rack just doesn’t cut it when you’re trying to stand out in a crowd. Yes, fitted clothing for guys will almost always cost more than the generic wardrobe options you’ll find at your local department store. But when you think about the life cycle of your outfits, suddenly the price tag associated with custom fit clothing becomes much more reasonable. On average, a tailored suit should last five years, if it’s made with high-quality fabric and receives a moderate amount of wear. By comparison, the average men’s dress shirt lasts only two years. If you are willing and able to spend the extra cash for a custom-fit garment up front, you undoubtedly save in the long run. The extended time it takes for a premium-quality attire to fade, rip, or lose its shape means you can enjoy your clothes for longer periods, getting the most out of every item you buy. This is almost always of huge benefit for men, who tend to wear their clothing for longer periods of time without losing interest. Call it our “if it isn’t broke, don’t fix it” mentality, if you will. 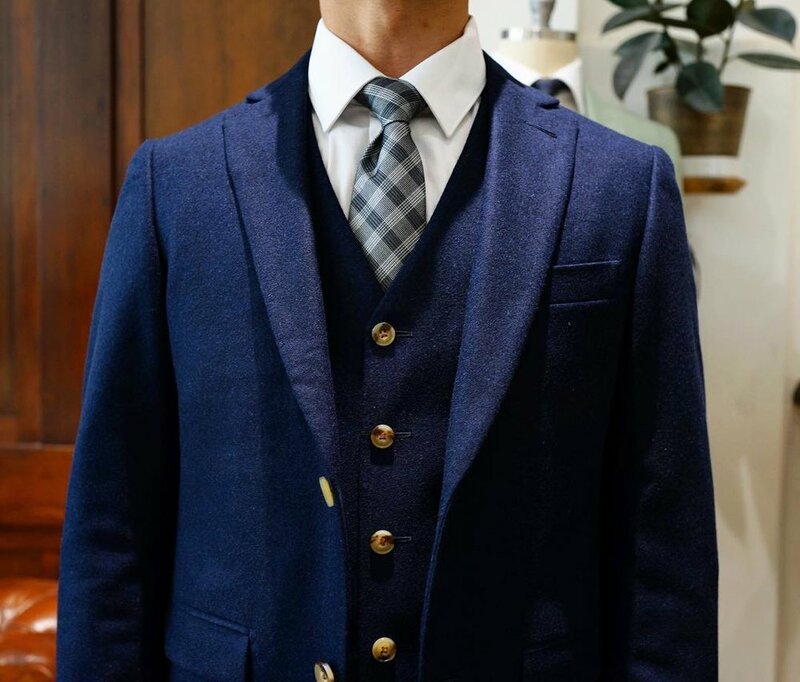 If finding that charming, debonair suit that will keep you looking dressed to kill for years to come is of greatest importance to you, then custom men’s clothing is an investment you won’t regret. Are you interested in learning more about our friendly, non-intimidating approach to men’s fashion? Or maybe you’re looking for a custom made tuxedo? If you’re ready to experience the difference that comes with a completely tailored, hand-selected men’s suit, contact us today!